VUEPoint is an innovative new process for system optimization that brings the power of beam steering to virtually any mainstream line array application. 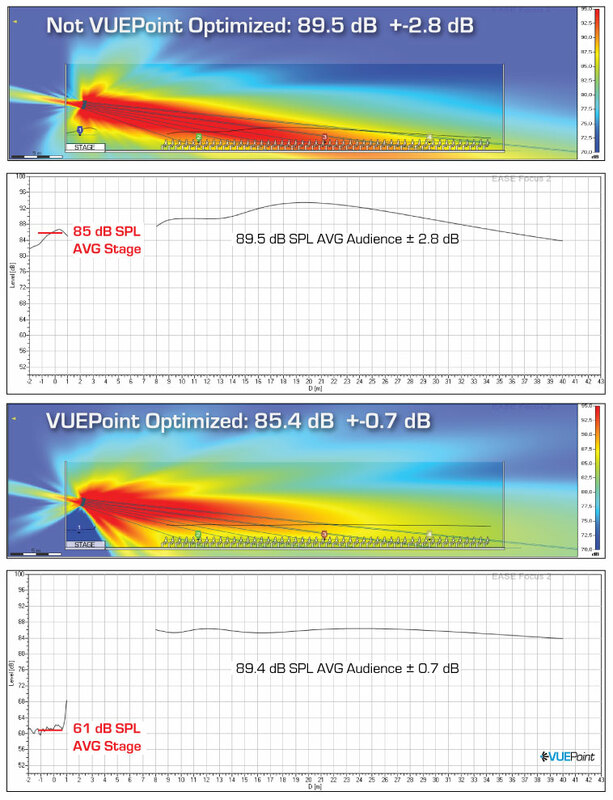 VUEPoint is an innovative new process for system optimization that brings the power of beam steering to virtually any mainstream line array application. 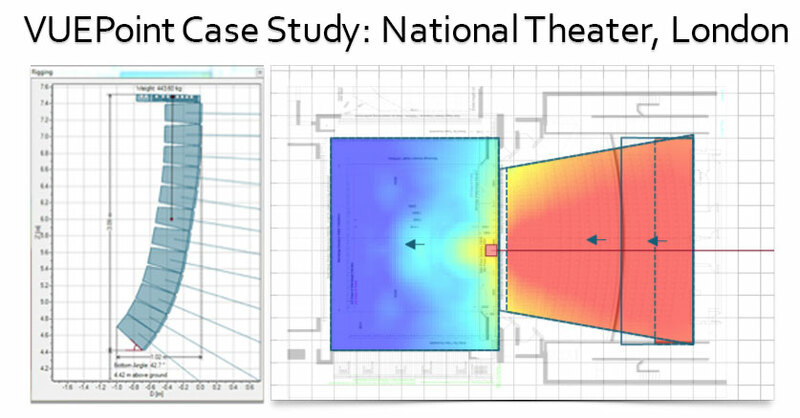 Deceptively simple, the VUEPoint process relies on industry-standard acoustic modeling and room optimization tools from the experts at AFMG Technologies. These tools are combined with VUE’s powerful DSP architecture and SystemVUE control software to enable digital coverage optimization of any VUE line array system in any environment. 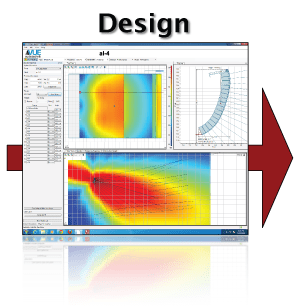 Unlike other beam steering applications that rely on proprietary and overly complex designs, VUEPoint is based FIRmaker from AFMG Technologies, the undisputed leaders in acoustic measurement and room modeling software. 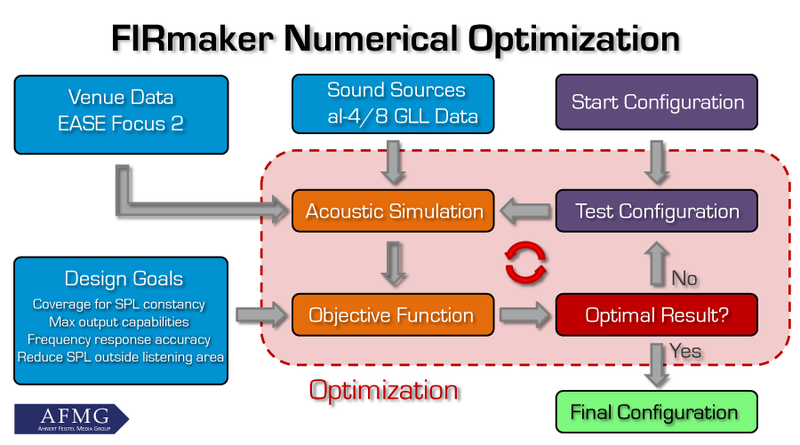 With FIRMaker at it’s core, VUEPoint is a powerful sound optimization tool that utilizes AFMG’s highly accurate EASE acoustic modeling engine to process complex room and system information including venue geometry, array locations and configuration, as well as high-resolution GLL loudspeaker data. The FIRmaker algarithm then generates a set of custom FIR filters that users can upload to VUE’s sophisticated DSP engine in order to optimize the line array’s coverage, response and overall output characteristics specifically for the given venue. Most importantly, ever VUE Audiotechnik line array system is compatible with VUEPoint. There’s no need to retrofit any cards or hardware. The existing DSP architecture and SystemVUE networking/control software are already capable of addressing every requirement of the VUEPoint process. State-of-the-Art line array modeling data with the resolution and depth to drive the steering algorithms accurately. A powerful DSP architecture is required to properly implement the customized FIR filters produced by FIRmaker during the VUEPoint process. Fortunately, every VUE DSP-enabled loudspeaker system was designed from the ground up to be part of the highly sophisticated SystemVUE network. This means that everything from transducers, amplifiers and DSP, all the way out to the SystemVUE Software itself, works in perfect harmony to enable precise control and easy access at every level. This is the foundation of VUEPoint, and the very synergy that makes it possible for VUE Audiotechnik to implement AFMG’s FIRmaker technology so seamlessly. In fact, the only software that users really need in order to take full advantage of VUEPoint beam steering for their VUE line array system is a copy of EASE Focus 2 and the SystemVUE monitoring and control application. Both are available as a download from the “Downloads” page at www.vueaudio. com. The VUEPoint process combines four cutting-edge technologies into a unified workflow. 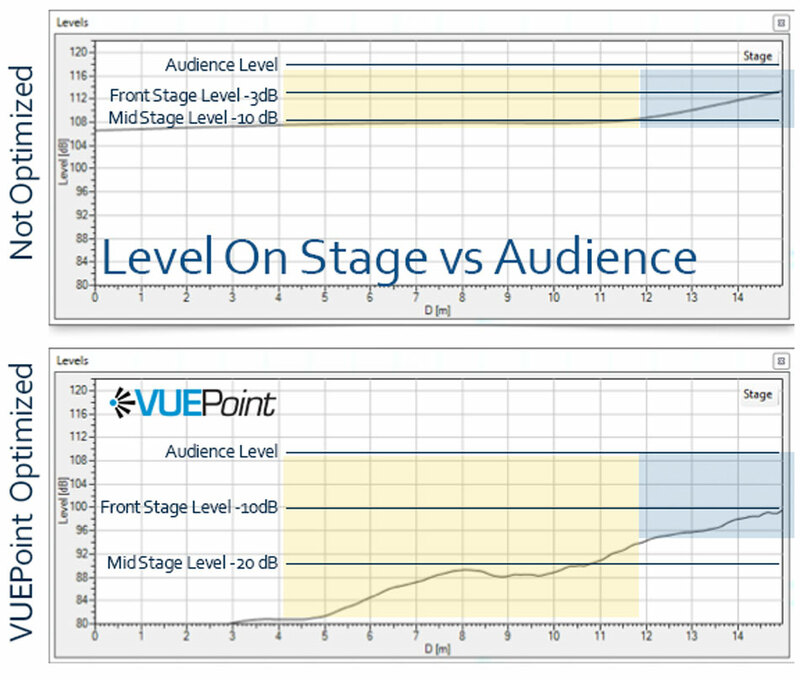 This section elaborates on each step of the VUEPoint, and explains exactly how to digitally optimize a VUE line array system for perfect coverage in any environment. 1. Design: The VUEPoint process begins with the designer inputting key venue and system parameters into EASE Focus 2 including room geometry, audience, and listening, areas as well as line array location and specific configuration (including all angles). With this data EASE Focus 2 generates a detailed model of the output and coverage within the venue. The designer can then adjust parameters such as array configuration and listening areas in order to fine tune output and coverage. Once the best room/system configuration is acheived, it’s time to move along to Step 2 where the beam steering process begins. 2. Calculating the FIR: At this step the system designer will send the EASE Focus 2 model, along with a description of the design goals (balance between max. SPL, smooth frequency response, along with the band to be optimized) to VUE or a certified VUEPoint contractor. This data will be fed into FIRmaker in order to produce a set of customized FIR filters for the specific room/system configuration. 3. Confirming the Results: VUE or the VUEPoint certified partner will then present a number of options from which the system designer can choose. 4. Uploading to SystemVUE: Once the design is finished, the customized FIR filters are uploaded into the line array’s V4 or V6 System Egnine via the SystemVUE software. 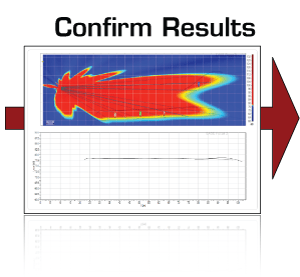 Final testing with acoustic measurement software such as AMFG’s Systune or Rational Acoustics Smaart ensures that the design specifications have been achieved (line arrays are hung properly in the right positions etc.). Once completed, the SystemVUE process has tailored the onboard DSP specifically for that system/room combination. The net result is a dramatic improvement in both coverage and spectral consistency. Most importantly, because VUEPoint utilizes the DSP that’s already inside every VUE line array system, the VUEPoint process can be applied to any VUE line array system regardless of configuration. EASE Focus 2 software and GLL data for VUE’s al-4 Subcompact Line Array System are currently available free on our Downloads page. 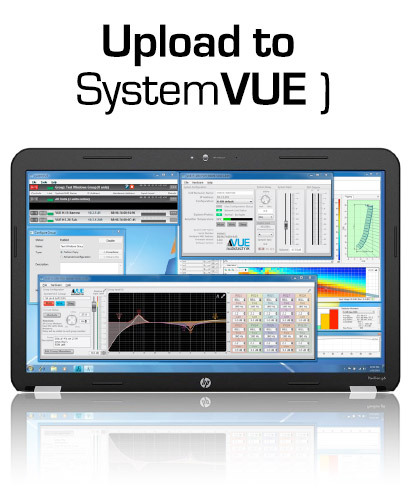 SystemVUE software is available in beta form as a free download. 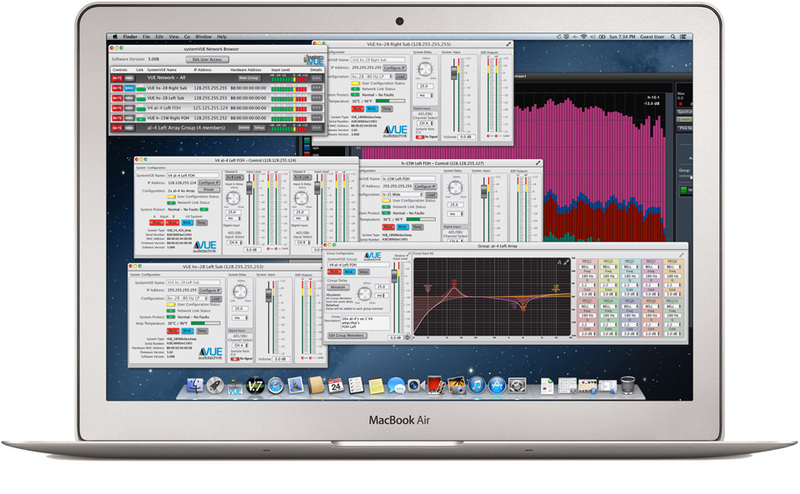 The SystemVUE application is free and fully compatible with both Macintosh OSX and Windows 7 operating systems.